I am Mexican. My country is a country of contrasts, a country in which you can find the richest man on earth, as well as people living in extreme poverty not so far from the richest neighborhoods in the most important cities. I drive to my parents' home once a week to have lunch with them, and every week, in the same corner, I see a poor family selling candy or some times just reaching their hand to beg for some money. The mom is always holding a baby in her "rebozo", while the "big kids" (around seven years old) are most of the time selling gum to the car drivers when the stop light is on. But my eyes always look for the little one, a toddler. He is always in a corner playing happily with empty milk cartons, or old toys. Every week, my heart aches. Many times we have brought food for them, or clothes, but there are always these questions in my heart, how can we really help those in need when you see them every where? Is there a real solution to all this poverty around me? Whom do we help? The family on the street, the friends that are going through hard (real hard) times, the children in a far away land with no drinking water? What is the Christian response to poverty? 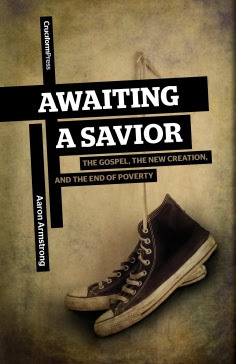 Aaron Armstrong has written a book, Awaiting a Savior: The Gospel, The New Creation and The End of Poverty, that has spoken directly to my heart. He has in few pages, answered many of these questions. And that is when I take a deep breath and keep on reading. Armstrong takes us back to Genesis, the Paradise, the Fall, and the curse that came as a result of it. This is the heart of the book, this is what makes this book so important; Awaiting a Savior goes to the root of the problem of poverty that surrounds us. This is a book that I greatly recommend as a tool to train the young people who want to come and do missions to poor countries. In Latin America, sadly to say, we receive many missionaries, many youth groups that come every summer to help build churches, and paint walls, and sing children's songs in poor areas; but we need to go deeper, we need to go to the root of poverty: sin in the heart man. Armstrong deals, then, with the root of poverty, but also with the root of our inability to respond in a God-glorifying way towards poverty. "Sin thus not only causes poverty but also poisons our attitude toward those suffering within it." Chapter Five, was probably my favorite. Armstrong reminds us of the Sermon of the Mountain and how "The gifts of love always precede the demands of love". Oh yes, Grace, amazing Grace that reaches to the poor effectively. "That is what is so devastating about the Sermon on the Mount. It starts with grace..."
And as the paragraph continued, it brought me to my knees in prayer, conviction and thanksgiving. Grace is the starting point; it was there where Jesus found me. It is there where we should start if we want to effectively help the poor among us until the day we see Jesus. *I was provided with a complimentary copy of this book by the author for the purpose of this review. I was asked to write an honest review.